Aerospace and engineering industry giant Northrop Grumman has partnered with California State University, Northridge’s College of Engineering and Computer Science to boost career opportunities for students, collaborate with faculty and enhance the school’s curriculum. The company selected CSUN as one of just 53 universities nationwide for its “Core University Partners” program starting with the 2013-14 school year. The program adds CSUN to an exclusive group of universities across the country known for producing top-notch engineering graduates, according to Charles Volk, vice president and chief technologist for Northrop Grumman Navigation Systems and a member of the college’s industry advisory board. The company, which has electronic systems right in CSUN’s backyard in Woodland Hills and aerospace systems in Redondo Beach, interacts with the university in several ways, including hiring scores of Matador engineering graduates, and sending many employees with bachelor’s degrees to earn their master’s degrees at CSUN. Alumni such as Peggy Nelson, M.S. ’91 (Electrical Engineering, Teaching Credential), vice president of engineering and global product development in the company’s aerospace systems sector, were instrumental in lobbying for CSUN’s inclusion as a Core University Partner. Nelson also sits on the college’s industry advisory board. “[Nelson] is an alumna from our electrical engineering program, and she’s the head of aerospace engineering for the whole company,” Ramesh said. “She has about 10,000 people reporting to her. “Over time there’s been a great relationship with Northrop Grumman in Woodland Hills, sponsoring research projects and things like that,” the dean said. “They segment the 53 [Core University Partners] based on their business sectors, and we’re targeted for aerospace and electronics. It’s based on the expertise of our faculty and our academic programs. About a month ago, Peggy contacted me about funding available through Northrop Grumman. We share a mutual interest in increasing the diversity of our workforce, and in particular the number of women in aerospace engineering. In addition to project-directed grants and helping secure federal grants, the company is helping mentor students and lending invaluable expertise in engineering students’ design competitions. Northrop Grumman participates in the college’s biannual Tech Fest event, as well as the annual engineering Senior Design Project Showcase. The showcase, which is open to the public, spotlights senior capstone design projects — judged entirely by a panel of industry experts, several of whom are from Northrop Grumman. Through the college’s Design Clinic Program, teams of students and faculty work with the company and others to help solve contemporary design problems with clear deliverables. “We talked about [the Design Clinic] with Northrop Grumman and they loved it, because it enhances research opportunities for our faculty and students — allowing them to make tangible contributions on cutting-edge projects,” he said. On May 13, Ramesh and other CSUN delegates represented the college at the state capitol in Sacramento, participating in CSU Engineering Day. 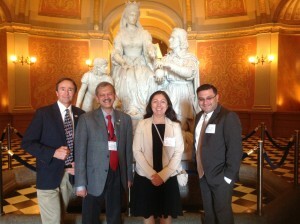 The CSU chancellor’s office invited the CSUN delegation to meet with Gov. Jerry Brown’s staff, and they praised the group for its diversity and strong student representation. The group held up CSUN’s recent Hispanic-Serving Institutions STEM grant, funded by the U.S. Department of Education, as a prime example. Entitled AIMS2 (Attract, Inspire, Mentor, and Support Students) is a collaborative five-year, $5.5 million grant with Glendale Community College and College of the Canyons that supports transfer students and includes 200 Matador engineering and computer science students, Ramesh said. CSUN College of Engineering and Computer Science delegation visits the State Capitol rotunda in Sacramento, for CSU Engineering Day. L-R: Chris Erickson, senior manager and chief engineer at Aerojet-Rocketdyne; S.K. Ramesh, college dean; graduating mechanical engineering senior Melissa Flores; engineering management professor Jimmy Gandhi, director of the Center for Innovation and Entrepreneurship.